Grab a Daydream headset and get ready to jump into the cockpit of one of the world’s fastest motor sports in virtual reality: The Red Bull Air Race World Championship, a time trial using planes to race a low-level slalom track marked by 25-meter-high, air-filled pylons. It’s fast, exciting, and requires nerves of steel to win. The lightweight race planes hit speeds up to 370 kph while enduring forces of up to 10G. This combination of high speed, low altitude and extreme maneuverability makes the sport accessible only to the world's most exceptional pilots. 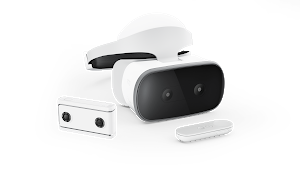 But with Daydream, Google’s platform for high-quality, mobile VR, you can now get right into the air-racing action—both live and on demand. The Red Bull Air Race LIVE VR app uses real-time flight data directly from the pilot’s cockpit and re-creates the races in a 360° virtual reality experience. You can check out races that have already taken place, or join the action live during the upcoming Red Bull Air Race World Championship starting with Abu Dhabi on February 2, 2018. The VR experience is powered by telemetry data like latitude, longitude, roll, pitch and airspeed to generate breathtaking perspectives and a live visualization of the pilots’ view onto an environment guided by Google Maps footage. You can also track the speed of the pilot and how much G Force they’re pulling. To develop the experience, we worked with Red Bull Air Race to capture data from more than 40 flights at the 2017 World Championship season finale at the legendary Indianapolis racetrack in the US. At a dedicated Red Bull Air Race LIVE VR booth, more than 1,000 fans were among the first to virtually hit the skies. One of the highlights was the outstanding flight of Yoshihide Muroya from Japan, who set the track record in his final run on his way to being crowned World Champion 2017. If you want to join Yoshihide and the other pilots in the cockpit, just download the “Red Bull Air Race LIVE VR App” in the Google Play Store, drop your Pixel or any other Daydream-ready phone into the headset and get started. See you at the 2018 World Championship.